If the Criminal Abortion Law is repealed, it will leave unsuspecting women vulnerable to dangerous late-term abortions being performed outside of a hospital and non physicians will be able to perform invasive surgical procedures on women without their consent. Albuquerque, NM- New Mexico ranks in the top 5 states with the highest population of Catholics. The state has also been primarily run by democrats since 1930. Each legislative session, since our arrival as evangelical pro-life missionaries in 2010 by the invitation of catholic priest Fr. Stephen Imbarrato, it has been catholic democrats who consistently vote to kill pro-life legislation year after year. Voting democrat in New Mexico has become a generational curse that has produced the nations late term abortion capital and worst national rankings for violent crime, poverty and education. Archbishop John C. Wester issued the following statement regarding the paid advertisement published in the Albuquerque Journal on January 22, 2019 entitled, “An open letter from New Mexico faith leaders ‘We support a woman’s decision about abortion’”. Abortion Free New Mexico applauds Archbishop John C. Wester and the Archdiocese of Santa Fe for their swift response and stand in solidarity with them in their support for the sanctity of life from conception to natural death. However, is there more they can do to hold professing Catholic state officials more accountable and to encourage catholic laity to vote more conscientiously regardless of political affiliation? 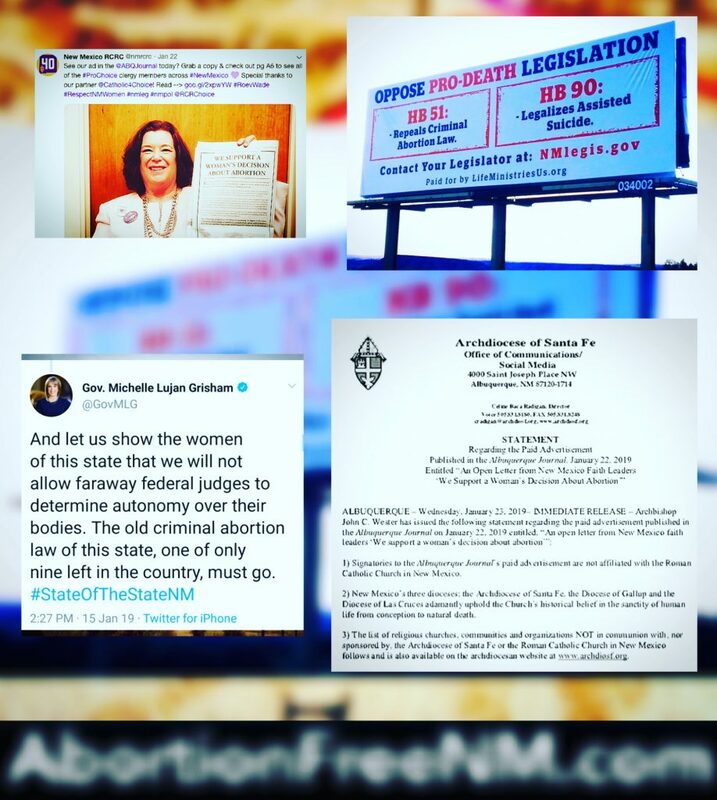 (New Mexico Conference of Catholic Bishops) Click here to read the three Bishops of New Mexico’s official statement addressed to Catholic legislators on March 6, 2017 regarding abortion, doctor-assisted suicide and the Catholic Church. 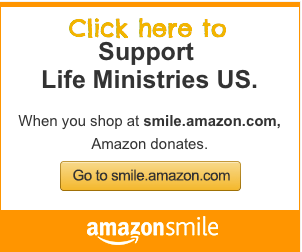 “As pro-life missionaries serving in New Mexico since 2010, Bud and I stand in solidarity with Fr. Stephen Imbarrato in calling for catholic leadership to take action against self professing catholic legislators that continue to defy their faith and promote a culture of death. It’s simply not enough to make statements and not follow through with public reprimands when the lives of the unborn are on the line. New Mexico is full of faithful catholics and evangelical Christians who must put their faith into action and make their voices heard on behalf of life. New Mexico’s reputation as the Late-Term Abortion Capital of the world will not change if we don’t elect better leaders and hold current leaders accountable. Now is the time to speak up and take action to OPPOSE PRO-DEATH LEGISLATION. 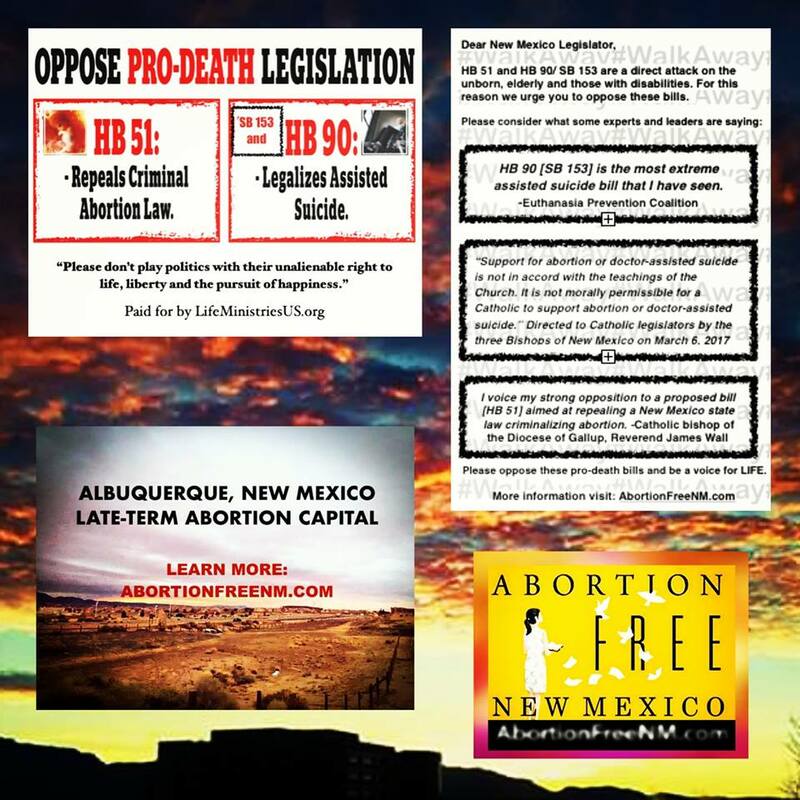 Abortion Free New Mexico recently sent out postcards to 1,000 churches across New Mexico urging them to OPPOSE PRO-DEATH LEGISLATION. It is our hope that Christians all across this state will rise up and send a strong unified voice for LIFE to our elected officials. 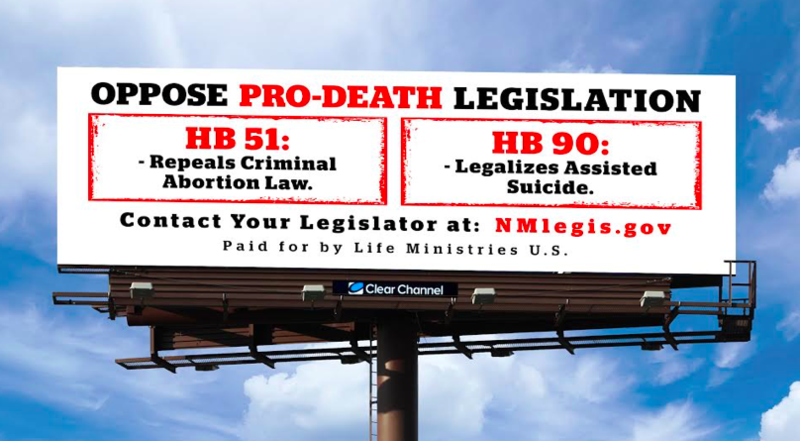 Albuquerque, NM- Thanks to overwhelming grassroots support our billboard is NOW up and we have secured it for the ENTIRE 60 day legislative session that ends on March 16, 2019! In addition, we DELIVERED several thousand postcards throughout New Mexico during the first week of the legislative session. We sent postcards to Veterans 80+ years and older! We sent postcards to pro-life conservatives! 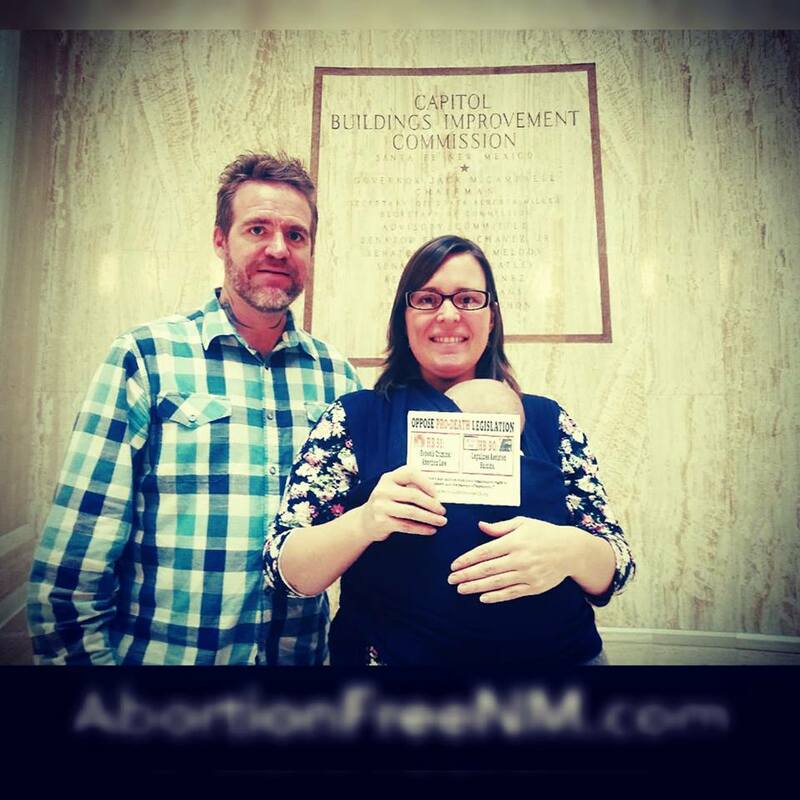 On Wednesday, January 16, 2019 Abortion Free New Mexico’s Bud and Tara Shaver were up in Santa Fe, New Mexico for the annual Sanctity of Life Awareness and Unity Day and hand delivered 112 postcards to all 70 Representatives in the House and all 42 state Senators urging New Mexico state legislators, both Democrat and Republican, to OPPOSE PRO-DEATH LEGISLATION. 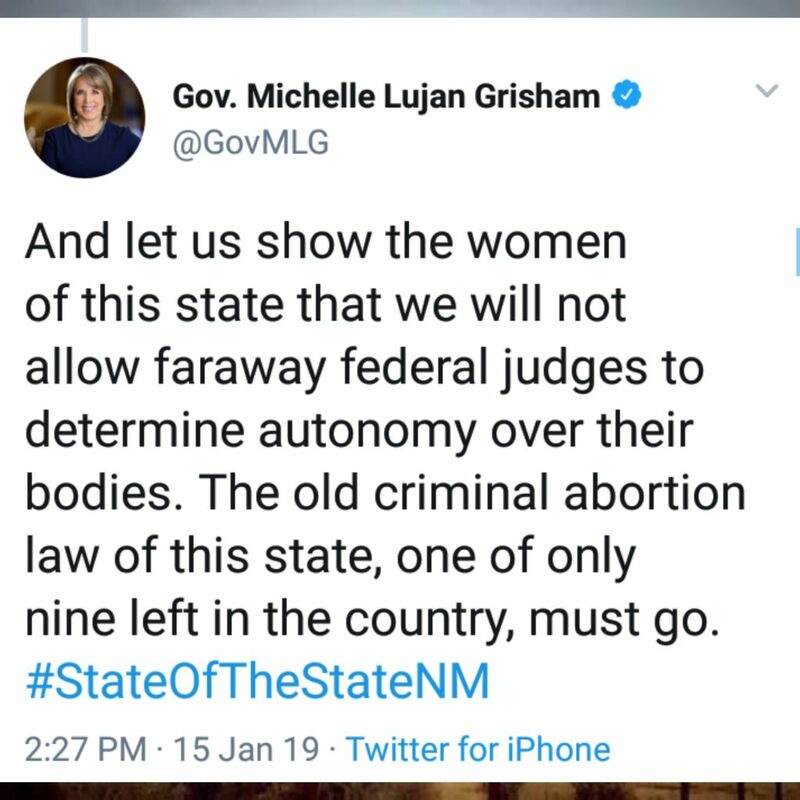 Newly elected Governor of New Mexico, Michelle Lujan Grisham (D) stated during the election that she supports the legalization of assisted suicide. 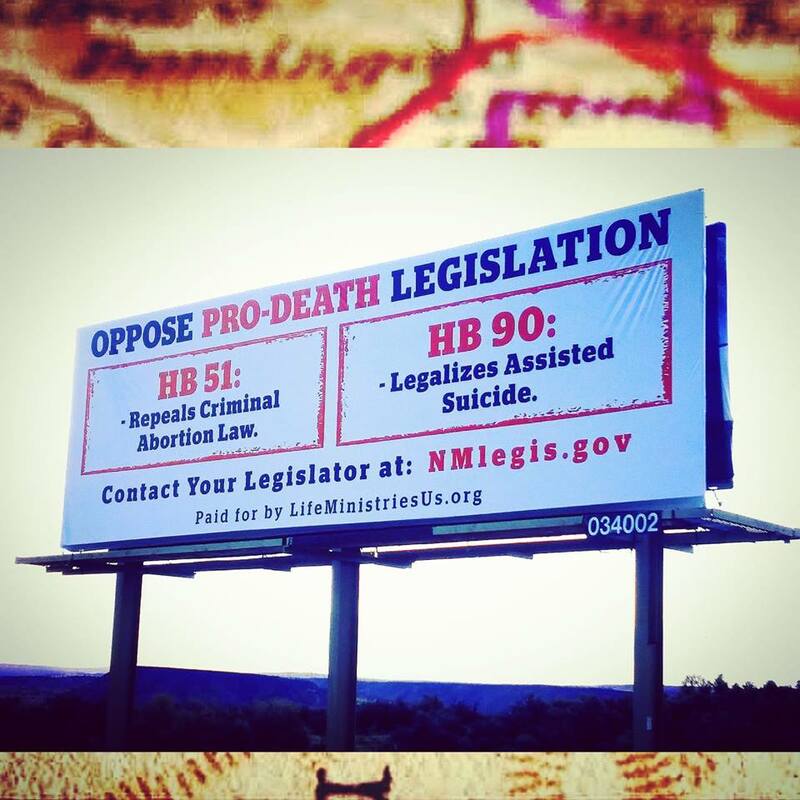 OUR GOAL IS TO CONTINUE SENDING OUT POSTCARDS ALL ACROSS NEW MEXICO BEFORE THESE BILLS CAN REACH THE GOVERNORS DESK!